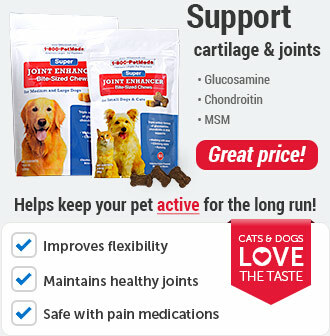 Advantage Multi is an effective, convenient monthly topical solution for dogs and cats. It offers broad spectrum parasite protection in one easy application. 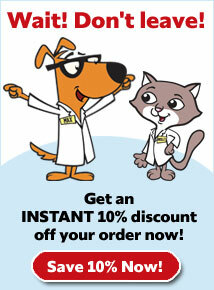 Advantage Multi for Dogs offers heartworm disease prevention that forgives if you forget. We all know how busy life can be and remembering to give heartworm protection on the same day every month can be a challenge. With Advantage Multi for Dogs, if you forget and go over 30 days between applications, just treat immediately and resume your monthly schedule. Advantage Multi for Dogs also kills adult fleas through contact, meaning they dont have to bite your dog to die. Additionally, the product treats flea infestations as well as 3 common intestinal parasites that infect and harm dogs (roundworms, hookworms, and whipworms). It also treats a very itchy skin mite called sarcoptes, which can infect people. 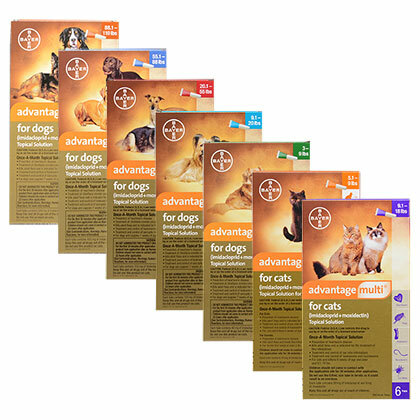 Advantage Multi for Cats kills adult fleas through contact meaning they dont have to bite and feed on your cat die. It treats flea infestations as well as treats and controls the common occurring ear mite and intestinal parasites roundworms and hookworms. Advantage Multi for Cats prevents also heartworm disease, an often overlooked concern in cats. Additionally, Advantage Multi for Cats is also the first and only FDA-approved product to kill adult fleas, treat flea infestations, and prevent heartworm disease in ferrets. NOTE: Advantage Multi does not protect against ticks. For additional 8 months of protection against fleas and ticks in dogs and cats, use the Seresto Collar. Heartworm prevention for dogs that fits your life style. If you forget and go over 30 days between applications, just apply immediately and resume your monthly treatment schedule. Kills adult fleas through contact. 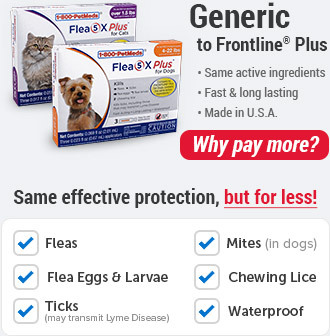 Fleas dont have to bite your dog or cat to die. 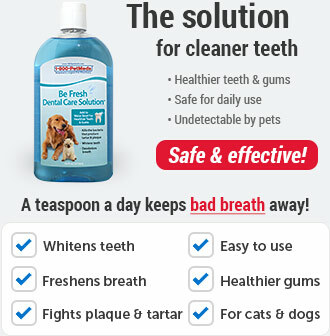 Also treats fleas infestations. Treats AND controls roundworms, hookworms, and whipworms in dogs and roundworms and hookworms in cats. Individual sensitivities, while rare, may occur after using any pesticide product for pets. If signs persist, or become severe, consult a veterinarian immediately. Safety has not been established in breeding, pregnant, or lactating dogs. Not for human use. Keep out of the reach of children. Children should not come in contact with application sites for two (2) hours after application. Causes eye irritation. Harmful if swallowed. Do not get in eyes or on clothing. Avoid contact with skin. Exposure to the product has been reported to cause headache; dizziness; and redness, burning, tingling, or numbness of the skin. Wash hands thoroughly with soap and warm water after handling. If contact with eyes occurs, hold eyelids open and flush with copious amounts of water for 15 minutes. If eye irritation develops or persists, contact a physician. If swallowed, call a poison control center or physician immediately for treatment advice. Have person sip a glass of water if able to swallow. Do not induce vomiting unless told to do so by the poison control center or physician. People with known hypersensitivity to benzyl alcohol, imidacloprid or moxidectin should administer the product with caution. In case of allergic reaction, contact a physician. If contact with skin or clothing occurs, take off contaminated clothing. Wash skin immediately with plenty of soap and water. Call a poison control center or physician for treatment advice. What is the most important information I should know about Advantage Multi? Advantage Multi for Dogs is available in the following concentrations; Advantage Multi 9 containing imidacloprid 40 mg and moxidectin 10 mg in 0.4 ml tubes for dogs 3-9 lbs, Advantage Multi 20 containing imidacloprid 100 mg and moxidectin 25 mg in 1 ml tubes for dogs 9.1 to 20 lbs, Advantage Multi 55 containing imidacloprid 250 mg and moxidectin 62.5 mg in 2.5 ml tubes for dogs 20.1-55 lbs, Advantage Multi 88 containing imidacloprid 400 mg and moxidectin 100 mg in 4 ml tubes for dogs 55.1 to 88 lbs, and Advantage Multi 110 containing imidacloprid 500 mg and moxidectin 125 mg in 5 ml tubes for dogs 88.1 to 110 lbs. For dogs over 110 lbs, use the appropriate combination of Advantage Multi for Dogs tubes. Advantage Multi for Cats is available in the following concentrations; Advantage Multi containing imidacloprid 23 mg and moxidectin 2.3 mg in 0.23 ml tubes for cats 2-5 lbs, Advantage Multi 9 containing imidacloprid 40 mg and moxidectin 4 mg in 0.4 ml tubes for cats 5.1 to 9 lbs, and Advantage Multi 18 containing imidacloprid 80 mg and moxidectin 8 mg in 0.8 ml tubes for cats 9.1 to 18 lbs. For cats over 18 lbs, use the appropriate combination. Children should not come in contact with the application site for two (2) hours after application. What should I discuss with my veterinarian before applying Advantage Multi? Tell your veterinarian if your pet is breeding, pregnant or lactating since safe use of this product in these cases has not been determined. Do not use in pets that are allergic to Advantage Multi or either of the individual ingredients, imidacloprid (Advantage II, K9 Advantix II) or moxidectin. How should Advantage Multi be applied? Advantage Multi is applied topically to the skin. It is not given by mouth. Follow the manufacturer's directions for application. Do not apply to irritated skin. Apply each dose once a month, every 30 days. If you do not understand the directions, or if you have difficulty applying the medication, contact your pharmacist or veterinarian. Store Advantage Multi at temperatures between 39 F and 77 F, avoiding excess heat or cold. What are the potential side effects of Advantage Multi? If any of the following serious side effects occur, stop using Advantage Multi and seek emergency veterinary medical attention: an allergic reaction (facial swelling, hives, scratching, sudden onset of diarrhea, vomiting, shock, seizures, pale gums, cold limbs, or coma). Contact your veterinarian if your pet shows scratching, rubbing, licking the application site, lethargy, decreased appetite, or hyperactivity. Contact your veterinarian if your pet shows lethargy and prolonged periods of sleep, behavioral changes including agitation, excessive grooming, hiding, pacing, etc., discomfort at the application site (rubbing, scratching, etc. ), increased salivation within 1 hour of treatment, increased drinking, or coughing. A medicinal odor and residue at the application site may also be noticed. Ingestion of this product by pets may cause serious adverse reactions including depression, salivation, dilated pupils, incoordination, panting, and generalized muscle tremors. In avermectin sensitive pets, the signs may be more severe and may include coma and death. Hair may appear stiff, matted oily, or damp after application. Other side effects may also occur. Talk to your veterinarian about any side effect that seems unusual or bothersome to your pet. What happens if I miss giving a dose of Advantage Multi? Apply the missed dose as soon as you remember. If it is almost time to apply the next dose, skip the missed dose and apply the next dose as directed. Do not apply 2 doses at once. What happens if I overdose my pet on Advantage Multi? Seek emergency veterinary medical treatment. Symptoms of overdose may include depression, increased salivation, tremors, or incoordination. What should I avoid when applying Advantage Multi? Always follow the dosage instructions provided by your veterinarian. 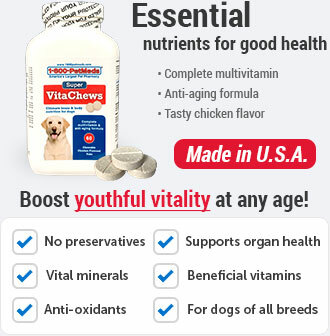 Do not use in dogs under 7 weeks of age or less than 3 lbs. Do not use in cats under 9 weeks of age or less than 2 lbs. Do not use Advantage Multi for Cats in ferrets under 2 lbs. 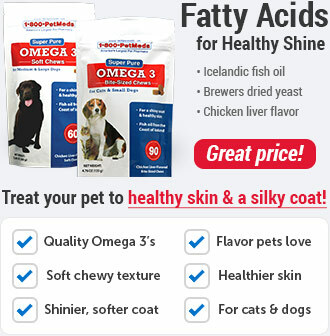 Do not use on pets that are sick, debilitated, or underweight. Do not use Advantage Multi for Dogs on a cat. Do not use Advantage Multi for Cats on a dog. Do not allow any pet to lick the application site for 30 minutes. Separation of treated pets may be necessary. Children should not come in contact with the application site for 30 minutes after application. Advantage Multi can cause eye irritation and be harmful if swallowed. Wash hands thoroughly with soap and water after handling. What other drugs will affect Advantage Multi? Talk to your veterinarian or pharmacist regarding any other medications, including vitamins and supplements, as well as other flea and tick products your pet is using. Advantage Multi for Dogs and Advantage Multi for Cats are prescription medications used for the prevention of heartworm disease. Advantage Multi for Dogs is also used in dogs for the treatment and control of flea infestation, hookworms, roundworms, whipworms, and sarcoptic mange. Advantage Multi for Cats is also used in cats for the treatment and control of flea infestation, roundworms, hookworms, and ear mites. Advantage Multi for Cats is also the first and only approved product to kill adult fleas, treat flea infestations, and prevent heartworm disease in ferrets. Do not use Advantage Multi for Dogs on cats or ferrets. Do not use Advantage Multi for Cats on dogs. Do not administer this product orally. Turn the cap over and push the other end of cap onto the tip of the tube. 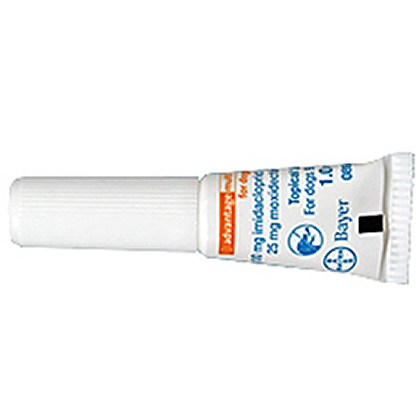 Remove one dose applicator tube from the package. Administer the entire contents of the Advantage Multi for Cats tube. FOR CATS: Part the hair on the back of your cat's neck at the base of the head, until the skin is visible. Place the tip of the tube on the skin and apply the entire contents directly on the exposed skin. Lift tube away from skin before releasing pressure on tube. FOR FERRETS: Part the hair on the back of your ferret's neck at the base of the head, until the skin is visible. Place the tip of the tube on the skin and apply the entire contents directly on the exposed skin. Lift tube away from skin before releasing pressure on tube. NOTE: Only Advantage Multi 9 should be used on ferrets. While your dog is standing, apply Advantage Multi 9 for Dogs topically according to the above instructions. Apply each dose once every 30 days. While your dog is standing, apply Advantage Multi 20 for Dogs topically according to the above instructions. Apply each dose once every 30 days. While your dog is standing, apply Advantage Multi 55 for Dogs topically according to the above instructions. Apply each dose once every 30 days. While your dog is standing, apply Advantage Multi 88 for Dogs topically according to the above instructions. Apply each dose once every 30 days. While your dog is standing, apply Advantage Multi 110 for Dogs topically according to the above instructions. Apply each dose once every 30 days. Apply Advantage Multi for Cats 2.1-5 lbs topically according to the above instructions. Apply each dose once every 30 days. Apply Advantage Multi 9 for Cats topically according to the above instructions. Apply each dose once every 30 days. Apply Advantage Multi 18 for Cats topically according to the above instructions. Apply each dose once every 30 days. Should be stored at room temperature between 39° F and 77° F, avoiding excess heat or cold. **For cats over 18 lbs use the appropriate combination.